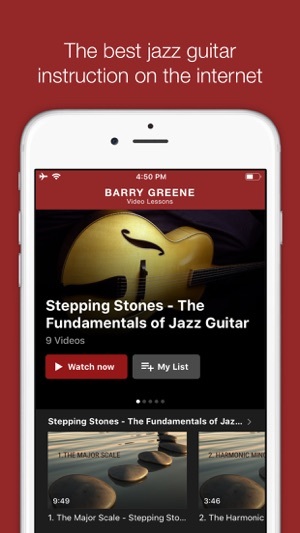 Subscribe to get access to hours of High Definition Online Jazz Guitar Lessons by renowned Jazz Guitarist Barry Greene, right on your Apple TV, iPhone or iPad. •For existing subscribers, you can simply sign in to your account to get access. No need to resubscribe. 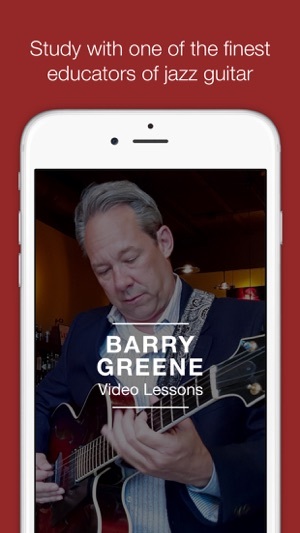 Barry Greene has been a leading instructor of jazz guitar for more than 20 years. Currently a professor of jazz studies at the University of North Florida, Barry has an extensive background in performance and instruction. He has played all over the United States and Europe and has garnered praise from some of the most influential guitar players in the world. 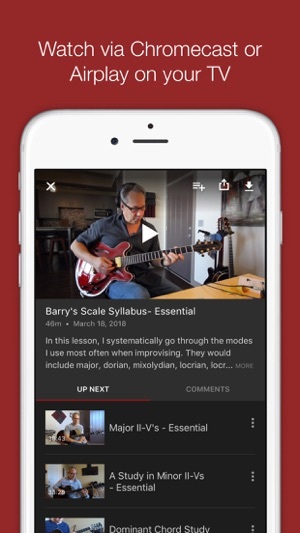 Take the opportunity to study with one of the finest educators of jazz guitar. 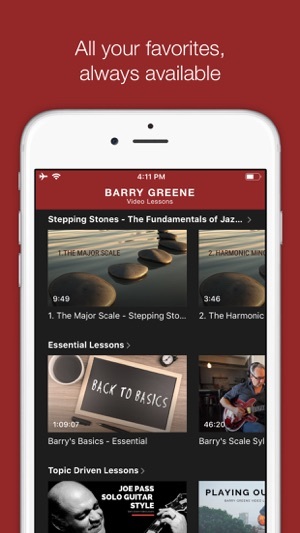 To access all features and content you can subscribe to Barry Greene Video Lessons on a monthly or yearly basis with an auto-renewing subscription right inside the app. * Pricing can vary by region and will be confirmed before purchase in the app. In app subscriptions will automatically renew at the end of their cycle. This is simply brilliant. The lesson material is lucid, insightful and thorough, well organized and clearly demonstrated. The pdf material likewise. 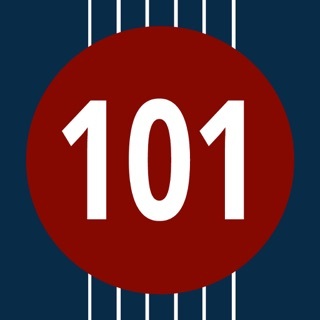 If you want to learn to play jazz on the guitar, this course is essential and possibly the most efficient way to get there. It is obvious that years to decades of work are behind this material. The app itself is of like caliber. Many thanks and full marks! Thanks so much Lee! I'm very happy to hear that you're enjoying the app! Barry is the man! If you need advanced, practical concepts on how to apply theory in a meaningful way, this is it! 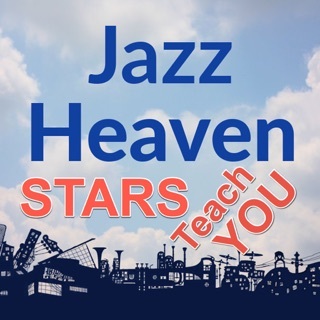 I only wish I had this back when I was in high school and college looking for a teacher who knew more than I already did about jazz. Revisiting the basics and running through tunes, these approaches really help. Thanks, let me know if you have any requests or suggestions!